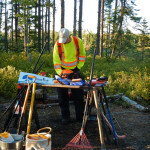 The following blog post is part of the People Behind the Trails series that is meant to celebrate people who have a positive impact on hiking trails in the province. We hope it will inspire you to, in your own way, give back to the beautiful trail systems in the province. Mark Hazen grew up in Quispamsis surrounded by the woods. He remembers exploring the surrounding woods and building many lean-to’s as a child. In high school he moved to a farm in Bloomfield. The farm was 35 acres of field with 75 acres of forest, which gave him ample wilderness to explore. At both locations he was surrounded by forest and took every opportunity to explore. He has been interested in outdoor pursuits of every kind, from sea kayaking to mountain climbing to rock climbing to hiking. 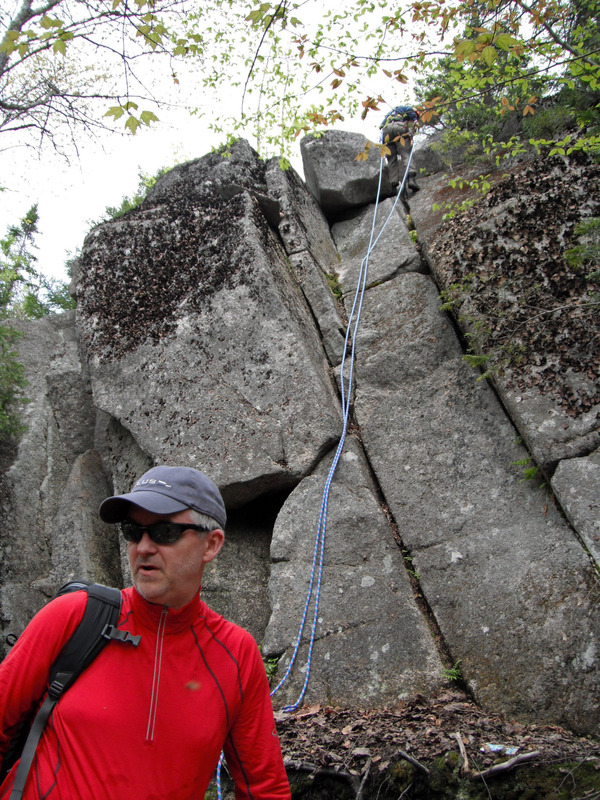 He has taught many outward bound type courses during his years in Saint John. About five years ago he decided to move to Moncton. His love for the outdoors soon led him to a job at the newly opening Ocean Trail outdoor adventure store. 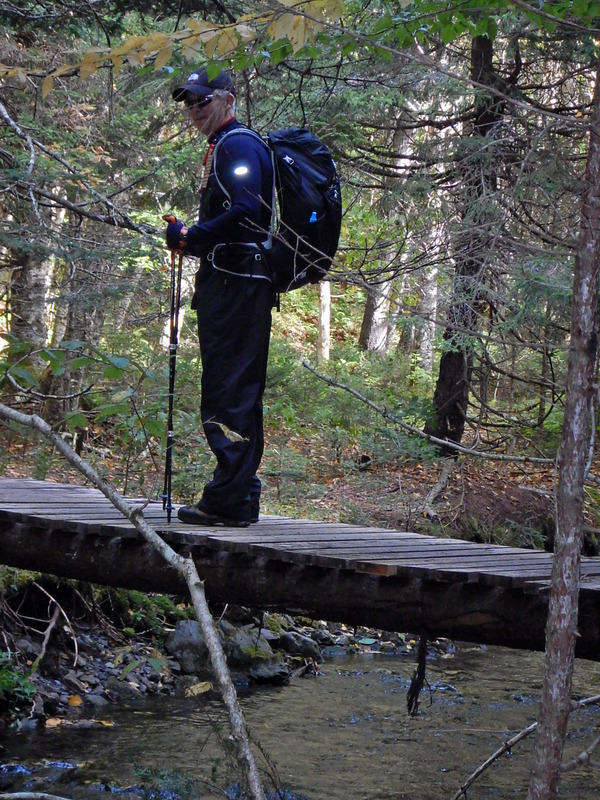 He has been a Trail Master for the Dobson Trail for the last several years. He also spends his time consulting for municipalities and schools on potential outdoor initiatives. Mark has been hiking for at least 25 years. 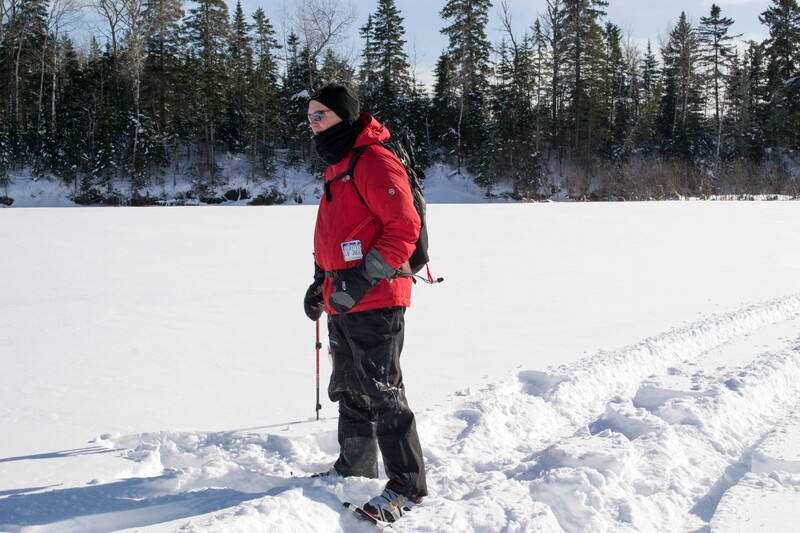 Most of his hiking has been around the province, mainly between Saint John and Moncton. In the past he has attended several climbing schools in the Rockies. In these schools he prepared for climbing Mount Robinson (3,954 m) in BC and Mount Athebasca (3,491 m) in Alberta. Mark’s first memory of hiking was with the Boy Scouts. 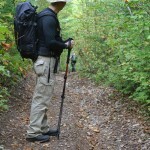 The group would hike into the woods in late November with no tents and build lean-tos for winter camping. Mark’s favorite memory of hiking was when he attended the mountaineering school in Alberta. They camped at the Bow Glacier and prepared for climbing Mount Athabasca. Helicopters couldn’t land at their campsite so they had to dive bomb the site to pick up containers of waste. They would hike on the Bow Glacier all day and practice probing for crevasses. One of his fellow students was unlucky enough to fall in several crevasses while they were roped together. This gave them practical experience for getting him out. They spent two months practicing on ice and 1 month practicing on rock. Their attempt at Mount Athabasca resulted in them reaching ¾ of the way up before weather forced them back down. 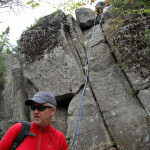 Although he is a Trail Master for the Dobson he thinks that the Fundy Footpath is the best hiking trail in the province. It is just so challenging and remote with endless beautiful scenery. He has hiked the Footpath twice and tries to hike the Dobson once or twice a year. He also loves the hike to the Footpath on the Goose River Trail at Fundy Park. Mark has a love for the outdoors and loves to use his chainsaw. 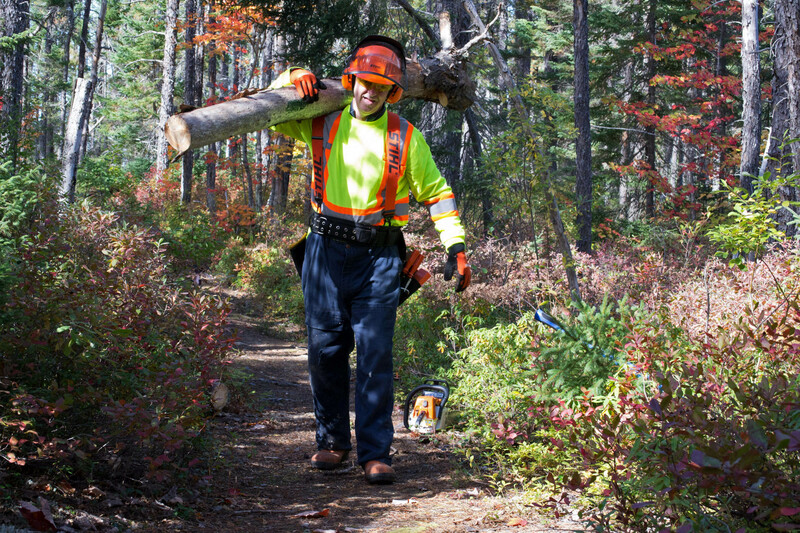 He uses his chainsaw, his time and any other resources he can pull together to help maintain the Dobson Trail. He tries to help wherever he can and if he doesn’t feel like he’s helping he will move on to other more productive activities. He also mentioned many times that having the right support is critical and he has found that support in his partner Charlene. The Dobson Trail is completely maintained and funded by volunteers so the lack of funds and lack of volunteers is the greatest challenge. 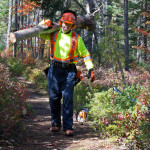 If the group could get 1 hour of volunteer time from everyone in the city and surrounding areas, this would amount to a huge increase in productivity for the maintenance of our trail systems. The trails could use donations for equipment required for trail maintenance such as chain saws, bush saws, shovels, rakes, bow saws, wheelbarrows, etc… The group could also use donations of gravel, lumber, siding, roofing, nails, screws etc… Just think if all the hardware stores took one category and could supply the group when needed, how much stronger our trail system would be! Mark’s goal is to get the owners of these stores to take a quick hike down one of the trail systems to see how much has been done and how much more could be done with a little help. 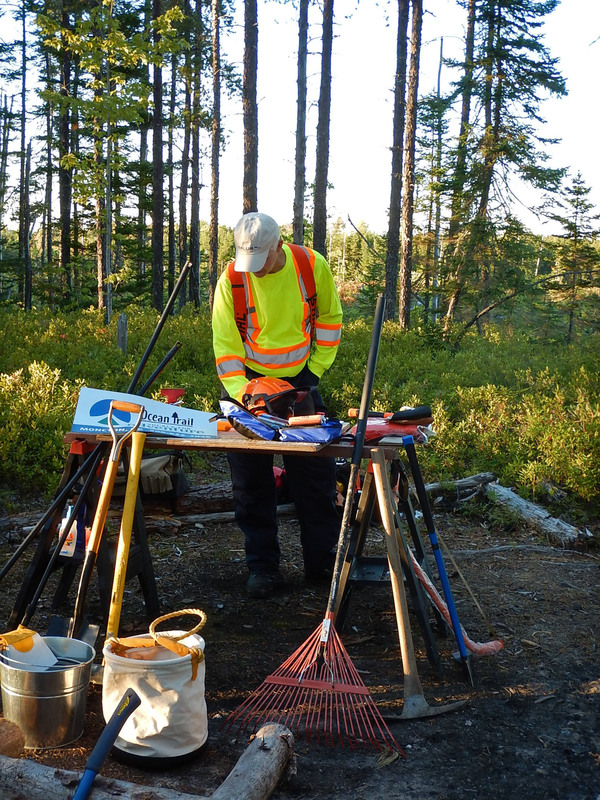 Volunteering is an obvious way to give back to the trails. Mark is the Trail Master for the Sand Hill Side Trail on the Dobson. He is also involved in the maintenance of the section from the Levee to Smith Road through Ocean Trail and the section from the tower to the levee with the Hub City Adventurers. He is also involved with maintenance on all other sections where needed. This past summer he was involved in the construction and installation of a large 1000 lb steel bridge on the Sand Hill Side Trail. He currently has half the materials for a new shelter he wants to build at the 20 kilometer mark and would like to see more campsites with proper bear boxes and proper fire pits. Mark volunteers extensively but he also enjoys teaching people about the outdoors and how to be safe when enjoying wilderness sports. He does this through outreach programs with local schools and through setting up workshops. He started the Hub City Adventurers Group a few years ago. 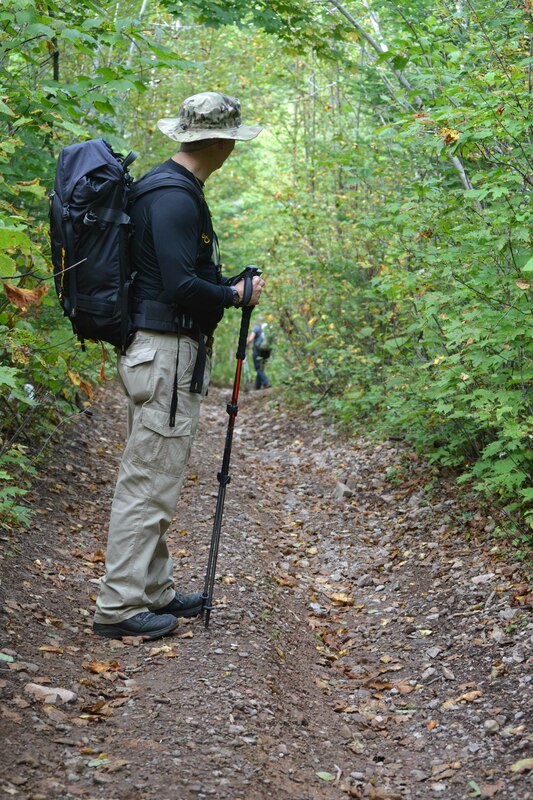 It is a group of like minded individuals who enjoy outdoor adventures and also help maintain the Dobson Trail. You can help by volunteering or by passing on your knowledge of the outdoors to others. The more people there are interested in the outdoors, the better our trails and society will be as a whole.